WomenArts is proud to introduce our new Associate Director, Isabelle Spike. Isabelle will be focusing on developing our social media campaigns and finding ways to increase participation in Support Women Artists Now Day/SWAN Day. If you follow WomenArts-SWAN Day on Facebook, you have probably noticed that we have been much more active in recent weeks. Isabelle is posting fun, inspiring items every day, and our fan list is growing fast. Please help us out by sharing our posts and encouraging your friends to "Like" us on Facebook. Also, please feel free to use our Contact Us form to send Isabelle links to pictures, SWAN events or other information that you would like us to consider for our Facebook page, blog or newsletters. We are especially interested in good pictures of women artists in action, inspiring videos, and descriptions of your SWAN events. An artist herself, Isabelle plays the violin, writes and directs for theatre, wrote her college thesis on Ibsen and Feminism, and loves visual art and design in all forms. She has taught music and theatre,and she is passionate about women artists and their role as change-makers in the world. She has honed her business and marketing skills working with other non-profits, lobbying for clean energy, and running a successful catering business. Look for her helpful tips on Facebook and Pinterest this month on organizing awesome SWAN Day parties! Planning A SWAN Day Party? 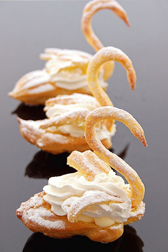 Get the recipe for these cute SWAN cream puffs or watch a video about carving an apple into a swan on the new WomenArts Pinterest page. Isabelle Spike has gathered lots of great party ideas and recipes on our Party for Parity board. She has also created great boards on SWAN Fashions, SWAN Art, and other SWAN topics! 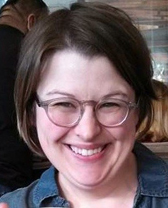 WomenArts welcomes our new Associate Director, Isabelle Spike.